This non-fiction book for readers aged 9 to 13 years is subtitled ‘Strange and Possibly True Australian Stories.’ A durable publication on good quality paper, its contents pages list has six sub-headings which read as follows: Mythical Creatures, Mysterious Locations, Haunted Places, UFO Sightings, Bizarre Disappearances and Strange Happenings with seven or eight articles in each. 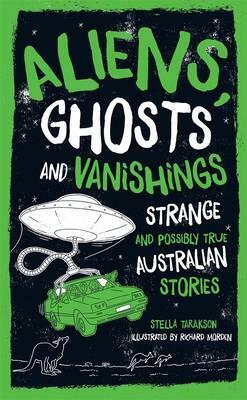 For an Australian child interested in exploring the strange and unusual in his or her country, there are certainly some very weird stories. Most adults would know about events such as the disappearances of Prime Minister Harold Holt and baby Azaria, the death of Phar Lap and of Lasseter’s Reef. But some of the stories in this book might be unfamiliar. These include the story of the disappearance of the steamship SS Waratah with passengers and cargo between Australia and England in 1909 and the retrieval of ancient African coins on Marchinbar, a remote Australian island, far off Northern Territory’s coastline -- coins over 900 years old. In both stories – and most stories in the book – the author poses theoretical questions which would surely give readers pause to wonder. Is the name ‘Waratah’ a jinx? After all, numerous ships with this name have vanished over the years. Was it Portuguese or Kilwan sailors who brought the coins onto land? Or were the coins washed ashore following a shipwreck? Or, stranger still, can Africans, rather than Europeans or Asians, have been the first non-Indigenous people to visit Australia? After each of the dozens of stories in Aliens, Ghosts and Vanishings (spontaneous combustion, abductions, UFOs, and more), there are break-out pages which provide extra information. The author has also included the many sources from her research which keen readers can follow up if they wish. There is also a fairly short glossary and credits for images. These images include black and white photos (such as the shower blocks from the supposedly haunted Sydney Quarantine Station, and a camel team sent out to search for Lassiter). The illustrator has also provided green images all throughout the book which appear to be some kind of print, perhaps lino, as well as line drawings, again in green. There is a green border around all of the 280 pages. Most books of the strange and weird are presented to readers in much more attractive and dramatic and colourful formats. But for the child who has an interest in their country and its strange past, this book provides many hours of fascinating reading.